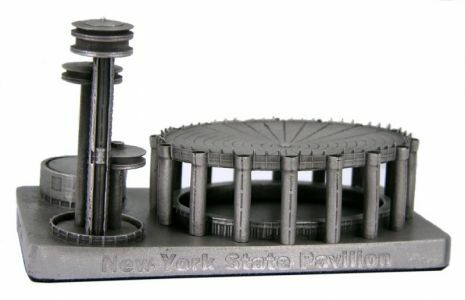 The New York State pavilion was designed by Philip Johnson & Richard Foster. It was commissioned by the state of New York for the 1964 World's Fair. At 226 feet tall, the tower was the highest point at the fair. The elliptical "tent" is supported by 16- 100' tall columns and measures 350' x 250'. The floor of the tent plaza is decorated with a enormous mosaic map of New York showing all of the Texaco gas stations in the state. The smaller 100-foot diameter building, the Circarama was used as a 360 degree theater. The Queens Theater now occupies the space. Our pewter model measures 5-1/4" x 2-3/4" x 3" tall and is finished in antique pewter.